Olive oil for health – and hair loss? 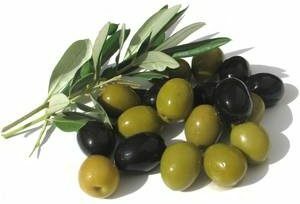 For over 10,000 years, olive trees have been grown in Mediterranean areas. The small fruits from these trees – olives – forroot caum one of the three key ingredients of the Mediterranean cuisine (the others being grapes and wheat). The Mediterranean diet is often recommended for its health benefits, reducing the risk of disease such as cancer, diabetes and heart disease (more on this later). Some studies even suggest olive oil is the main reason the mediterranean diet is so healthy. A recent medical trial compared rosemary oil against FDA approved hair loss treatment minoxidil. Surprisingly, rosemary oil was found to be even more effective than this established pharmaceutical alternative. Yet olive oil is far more popular online when it comes to hair loss. Do these people know something the researchers don’t? First, what is the cause of hair loss? There are many different types of hair loss. Each type of hair loss has a different cause and so there is no one-size-fits-all treatment. But by far the most common form of hair loss is androgenetic alopecia, or pattern hair loss. Pattern hair loss is most common in men – affecting around 70% of males at some point in their lives. It typically starts with thinning at either the temples or crown of the head and progresses until the top of the head is completely bald (Norwood stage 7). The popular medical explanation of male pattern hair loss is that it is caused by hormones – specifically dihydrotestosterone (DHT). DHT is a by-product of testosterone, the male hormone. However, despite the common myth, there is no evidence to suggest that bald men have more testosterone. Instead, doctors say that bald men have hair follicles that are more sensitive to DHT. However, there are a number of problems with this explanation. And what about women? Although less common than in men, pattern hair loss affects around 40% of women. Not only that, there is evidence to suggest this number is increasing. 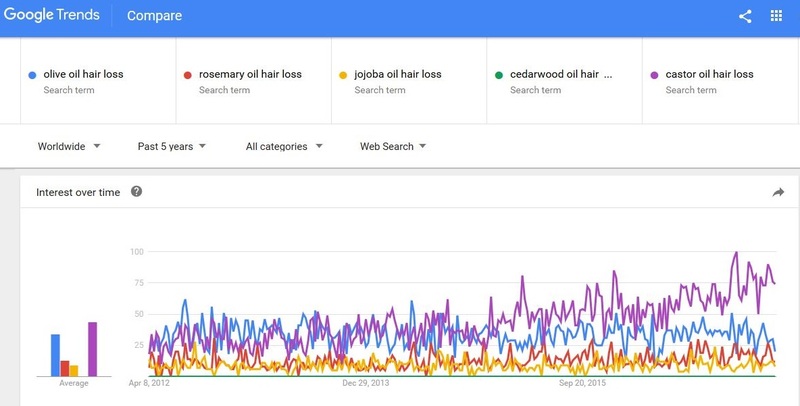 When answering the question of whether olive oil can prevent hair loss, I’ll primarily be talking about pattern hair loss – both male and female. Interestingly, research of olive oil provides useful insights into the causes and prevention of both. There is also evidence it may be beneficial for other types of hair loss too. First off: will applying olive oil directly to the scalp help prevent hair loss? Whilst natural hair loss treatments tend to get tested less than pharmaceutical ones, there have been a few trials of essential oils for hair loss. As well as the rosemary oil study described earlier, another interesting example is this study of essential oils for the treatment of alopecia areata – another type of hair loss. Both trials indicated positive results from these natural oils. But as for olive oil specifically, evidence is limited. 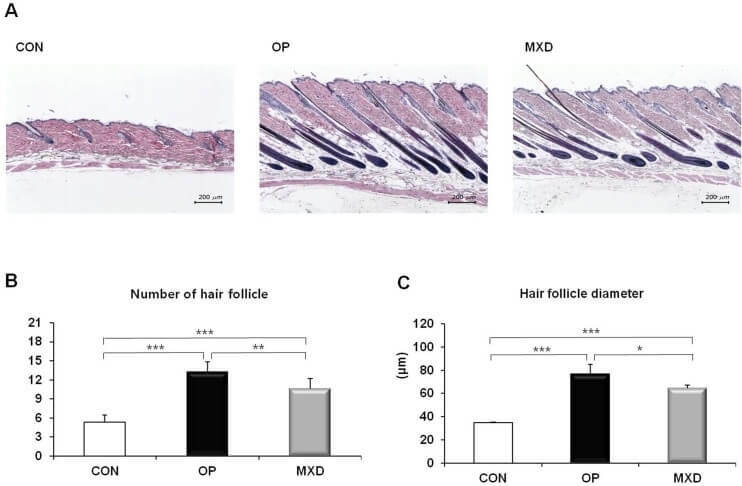 Perhaps the strongest example is this study of the effects of oleuropein on mice hair. Oleuropein is a compound found in olive oil and was found to ‘significantly increase’ the number and size of hair follicles compared to placebo. But let’s not get carried away: this is a study of mice, not humans. Nevertheless, these results at least justify further investigation. The fact that anagen (growth stage) was induced raises the possibility that olive oil could be useful to reverse telogen effluvium, a hair loss condition characterised by too many hairs entering the resting phase. Another method to possibly improve these results (though not tested in this study) is to combine olive oil with scalp massage. But where the research gets really interesting is with regards to dietary olive oil and hair loss. We saw earlier how the Mediterranean diet brings many health benefits. Many speculate – and with good reason – that olive oil is the primary reason for this. There is a growing body of evidence to suggest olive oil protects against cancer, diabetes, and heart disease. Heart disease is the number one cause of death worldwide, so this is a pretty big deal if true! But what’s this got to do with hair loss? Well, it sounds unbelievable, but individuals with pattern baldness are statistically far more likely to develop heart disease. In fact, one study found that men who went bald at the crown before age 45 were 36% more likely to suffer a cardiac event. This wasn’t a freak result, either. These results have been confirmed in many other trials. The good news is that a great many trials have shown that olive oil consumption may reduce the risk of heart disease1,2,3,4. There is a strong argument to be made that pattern hair loss and heart disease have a common cause: inflammation. Tackling this common cause gives a double benefit: reduced risk of heart disease and improved hair. The anti-inflammatory properties of olive oil are well documented1,2,3,4. 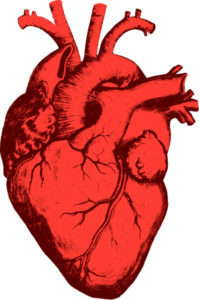 This helps explain why olive oil protects against heart disease. Most importantly, it implies it will be good for hair as well. Partly on the advice of doctors for the past few decades, the typical Western diet today is high in carbohydrates and omega 6 fats and low in omega 3 fats. Yet despite the trend for low fat diets, obesity, diabetes, and heart disease are on the rise. It also seems a bit too coincidental that these dietary have coincided with an increase in pattern baldness among young men and women. Only now are doctors are reconsidering these dietary guidelines. Simple carbohydrates (read: sugar) create a highly inflammatory environment that wreaks havoc inside the body. This is compounded by an extreme imbalance of omega 6 to omega 3 fats. This is where olive oil comes in. Olive oil is high in omega 3 fatty acids. Swapping oils high in omega 6 like sunflower, soybean, and corn, with olive oil will help redress the balance between the two. By itself, olive oil is unlikely to cure for the problems of the modern diet. However, incorporating it into your diet is likely to reduce inflammation, decreasing your risk of heart disease and slowing the progression of hair loss. It is also rich in antioxidants, vitamin E, vitamin K, and iron. For more information on pattern hair loss and diet, check out this article. Overall, olive oil shows promise for treating hair loss, both as a topical solution and as a dietary addition. But it is by no means a miracle cure. Oleuropein is a unique ingredient that may be of slight benefit when applied topically to the scalp. But it seems that many of the benefits for health and hair may not be specific to olive oil. Plenty of other foods are high in omega 3, for example. And plenty of other foods can reduce inflammation. Nevertheless, these benefits shouldn’t be underrated. As the role of inflammation in hair loss becomes increasingly clear, olive oil may prove to be a useful tool in improving both health and hair. Next post: What is the Best Finasteride Dose for Hair Loss? 1mg? 0.5mg? 0.25mg? Thanks for great info! I have hairloss problem since 3-4 years. My hairs are long but very thin.. I am using onion for hair and using some natural treatment shampoo. But still suffering with hair loss  Due to this problem I started to keep short hair style. Should I try to use olive oil with Castrol oil? Is it good for hair? Wow – Interesting study. Yes, the study was done with mice, but still a significant finding that olive oil can actually affect the hair growth stage. Maybe olive combined with Annurca apple? What’s Annurca apple? Has it been shown to have any effect on hair loss?